New York-based company Krasdale Foods, Inc. recently issued an allergy alert against a specific batch of its Crispy Honey Oats & Flakes. The product is believed to contain almonds that are not declared as part of its ingredients. Almonds are considered a common food allergen. People who are hypersensitive to almonds in any form may experience an allergy attack upon consuming Krasdale’s Crispy Honey Oats & Flakes. An allergy attack may be mild, or it could be serious and lead to death. Because of this, the company is recalling the affected product. To date, no allergy attacks have been reported that are linked to the product. The recall was made after it was found that the product’s packaging did not indicate the presence of almonds, which may be a part of the product’s ingredients. 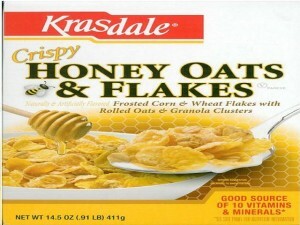 Recalled Krasdale Crispy Honey Oats & Flakes are packed in a 14.5 ounce cardboard box, with a “use by” date of “SEP 20 12 P4.” This code is indicated on the top part of the box. The product was distributed to independent food retailers, Bravo Supermarkets and C-Town Supermarkets in New York, New Jersey, Rhode Island, Connecticut, Pennsylvania and Massachusetts. Consumers who may have bought the recalled product can return it to the store where it was purchased in order to obtain a refund. Consumers who have questions or concerns may call Krasdale Foods at 800-378-5727 extension 5302. The hotline is available from Monday to Friday, 9 AM until 5 PM.